quick evening snacks collection. quick veg evening snacks. 5:00 or 6:00pm in the evening and your stomach starts making noise and craves something to munch, Yes! We are talking about evening snacks! Our collection of evening quick snacks is easy to prepare and will be loved by both adults and children. You can eat them as it is or along with delicious chutneys , dips and sauces. You can even serve them as starters or finger foods during a party or festive occasion or along with a meal. From famous roadside food to healthy snacks , we have covered them all to come up with an amazing collection of Quick Indian snacks recipes. Enter, to enjoy the convenience of preparing mouth-watering snacks, within minutes and without any advance planning. With simple ingredients that are available in our kitchens all the time, you can come up with quick evening snacks like Bread Fritters and Carrot Pinwheels. Chaats are light on stomach and loved by all. Samosa Chole, Crispy Aloo tikki Chaat from North, Jhalmuri and Puchka from east and Sukha Puri, Geela Bhel from West these chatpata chaats loaded with crunchy savouries like papadi and sev, juicy and colorful veggies, sweetened yogurts, peppy chutneys and spices, are sure to tickle your taste buds. Sandwiches are other simple snack recipes for your evening hunger pangs. Mini-open toasts or buns and crostini that make an amazing starter for parties to cold sandwiches whose stuffing can be made prior to serving. Empty your refrigerator and toss some ingredients together to make filling sandwiches like Schezwan Paneer Cold Sandwich, Cabbage, Carrot and Paneer Grilled Sandwich, Carrot and Cheese Toast or something like a Mini Pizza Topped with Olive, Jalapeno and Cherry Tomato, Cheese Garlic Buns. Similarly, you can make rolls and Frankie’s with such stuffing and enhance the flavor with cheese and chutneys. Masala Maggi with an array of vegetables and spices is a hit among everyone. Vegetable Maggi the last resort for bachelors and host elites, moreover everyone loves a hot bowl of instant noodles. Egg lovers can a beaten egg and make Spicy Maggi Egg Noodles. These are some easy snack recipes which take no time to cook and just handful of ingredients. 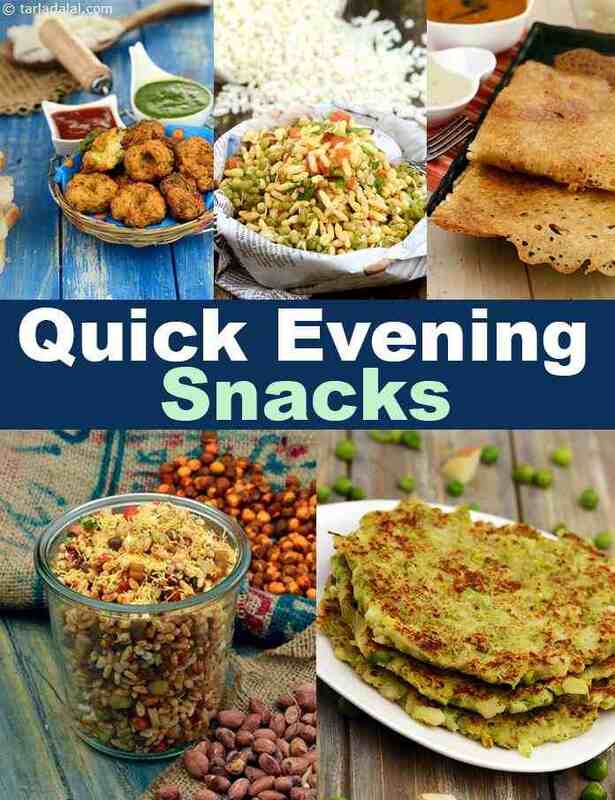 You can make evening snacks at home Spiced Sesame Popcorn, Herbed Makhanas, Baked Palak Methi Puris are some dry snacks which you can make in bulk and store it in an air-tight container. Munch on these jar snacks when hunger strikes! Below are some lip smacking vegetarian quick snacks recipes that you can try making at home and impress your friends and family! Enjoy our quick evening snacks recipes and quick recipe articles below. A triple-decker feast prepared with buttered bread roundels packed with a green peas mixture and refreshing cucumber slices. You will love the blend of crunchy cucumber and nutty green peas laced with mayonnaise and chilli sauce as you bite into the sumptuous green peas and cucumber sandwich.